Submitted by Fred on Thu, 04/10/2014 - 8:54pm. We have had much discussion at this blog about what has been termed by many as "police militarization." The term brings about an important debate about police equipment, methods and tactics even throughout the ranks of police themselves. In this Economist article 'Cops or Soldiers' this complex and controversial topic is brought up once again. Its time we police join in the discussion in a candid and yet respectful way, in an effort to truly answer the critical question have we police become to militarized? John Boyd warns not to react without analysis/synthesis and a new look. It is easy to see why the police like to be better armed than the people they have to arrest. They risk their lives every day, and are understandably keen to get home in one piece. A big display of force can make a suspect think twice about pulling a gun. “An awful lot of SWAT tactics are focused on forcing the suspect to surrender.” ~Bill Bratton, New York’s police chief. 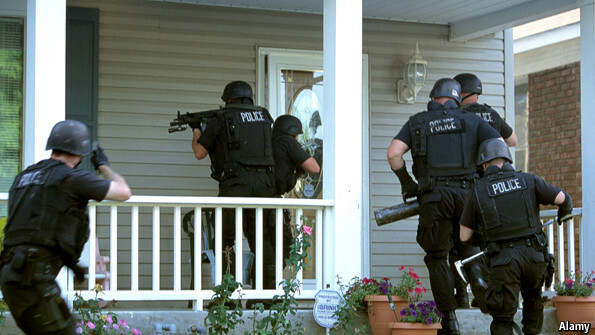 The issue of police militarization is simple to identify, yet hard to fix as you and I know. After 9/11, money poured into homeland security and state and local police forces. Much of the equipment is indeed needed and when our adversary is a severe threat even the critics of police militarizing themselves understand the need for specialized units and patrol officers prepared and equipped for a full spectrum action. But have we police gone to far, where, when and why we use them? Has not knowing about the harder to learn and understand advances in learning, and complex problem solving caused us to do what most Americans do, buy more things and play 'keep up with the, Jones's' (larger departments), when we should be making proper threat assessments and determining whether or not I need a specialized unit? People, ideas and things in that order is the term Col. John Boyd used to describe the approach to solving complex problems. Boyd's belief was with the right leadership, professionalism, and core values (morals),and recruiting the right people could make a profound difference in how we handle conflict and crisis. We can be the cutting edge to change this approach. Police have to get back to policing the community, gaining people's trust, getting away from the computerized, up armored patrol cars they do not like to leave, and return to the streets. This does not mean we get rid of SWAT teams and other specialized units. it does mean we use them sparingly and in only worse case scenarios based on sound assessments and tactical judgment. By police thinking at all levels, and using Mission Command, principles we can solve a host of police problems at the street level. Civil libertarians such as Radley Balko, the author of “Rise of the Warrior Cop”, fret that the American police are becoming too much like soldiers. Special Weapons and Tactics (SWAT) teams (ie, paramilitary police units) were first formed to deal with violent civil unrest and life-threatening situations: shoot-outs, rescuing hostages, serving high-risk warrants and entering barricaded buildings, for instance. Their mission has crept.